The perfect dessert for dinner parties, the holidays or a special treat, this cheesecake tastes richly decadent, yet is anything but decadent in calories. Spicy pumpkin and rich VOSKOS® Greek Yogurt come together for a smooth, sweet and easy-to-make cheesecake that your friends and family will obsess over. Using a mixer, blend together cream cheese and sugar. Add the eggs one at a time, scraping the bowl after each one. Beat in salt, vanilla, and cinnamon. 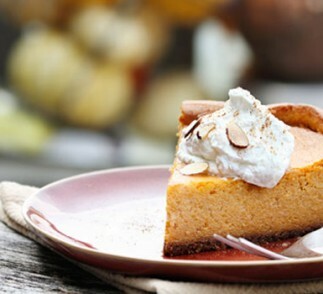 In a separate bowl, mix together pumpkin pie filling and VOSKOS Greek yogurt. Add yogurt mixture into cream cheese and mix until fully combined. Fill the desired crust or mold(s) and bake at 300* for 45-50 minutes.